1. 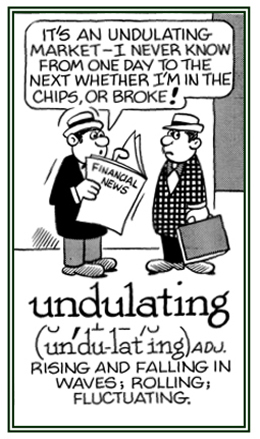 A condition or situation of being superfluous and unneeded. 2. That which is in excess or too much. 1. The state or fact of not, or no longer, being needed or wanted. 2. Something that is not or no longer needed nor wanted. 3. The use of a word, or words, whose meaning is already conveyed elsewhere in a passage, without a rhetorical purpose; excessive wordiness, or repetition, when expressing oneself. 4. With computers, the installation of duplicate electronic, mechanical components, or backup systems that are designed to come into use to keep equipment working if their counterparts fail. 5. Duplication of information in telecommunications to reduce the risk of errors. 6. 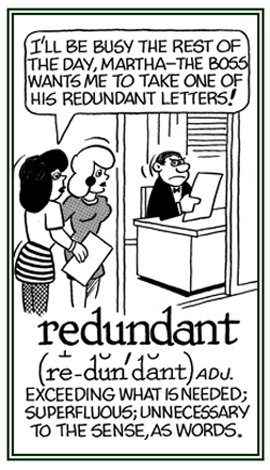 In Britain and Canada, a dismissal from work, or employment (unemployed), because the job or the worker has been deemed no longer necessary: After being declared redundant, Ivan was told that his services were no longer necessary; so, now he is in a status of redundancy. 1. Pertaining to the use of more words than are necessary to express an idea: The mayor's speech was considered to be the most redundant one that the citizens had ever heard; including, promises, promises, and more promises. 2. Referring to the repetition of words with the same meanings as others which are used several times in a presentation: In her speech, the politician became even more redundant than usual, saying: "and I repeat" and "I tell you again". 3. Descriptive of going beyond what is necessary or natural; superfluous: Serving chocolate ice cream with the chocolate cake, which was covered with chocolate icing, seemed quite redundant. © ALL rights are reserved. Relating to something that is exceeding what is necessary. A quantity that is more than what is considered to be appropriate; abundant to excess. 1. Exceedingly or excessively abundant; more than sufficient; excessive. 2. Too numerous, too abundant, or considerably more than is sufficient. 3. Above the normal amount or quantity; excess, surplus. Characterized by being above the normal amount or quantity; over supplied. 1. To extend on all sides simultaneously; to encircle. 2. To enclose or to confine on all sides so as to stop escape or outside communication. 3. Something; such as, fencing or a border, that surrounds an area. 4. The space around a thing or place: Karl has an inflammation that surrounds his left eye. 1. Confined on all sides. 2. Extended on all sides simultaneously; encircled. 3. Enclosed or confined on all sides so as to bar escape or outside communication. Referring to something that is encircled or enclosed. 1. To move in waves, or in a movement resembling waves, or to cause something to move in this way. 2. To function or to exist in a wavy pattern or with a rising and falling motion. Characteristic of fluctuating or rolling in waves and in movements resembling waves: Sam was watching with amazement at the undulating stomach of the belly dancer. There are some people who are checking their undulating financial investments in hopes that they will be making a profit. © ALL rights are reserved. 1. In a wave-like motion; a gentle rising and falling in the manner of waves. 2. A motion to and fro, up and down, or from side to side, in any fluid or elastic medium, propagated continuously among its particles, but with no translation of the particles themselves in the direction of the propagation of the wave; a wave motion; a vibration. 3. A regular rising and falling, or movement, to alternating sides. 4. One of a series of wavelike bends, curves, or elevations. 1. A waving or sinuous motion; a wave. 2. An appearance as of waves; a gentle rise and fall. 3. In physics, the continuous propagation of waves through a medium.